The Royal Mint commissioned sculptor-designer George E. Kruger-Gray to produce models that would incorporate the new armorial bearings. Kruger-Gray prepared the beautiful design shown, and patterns were struck in bronze and dated 1928. 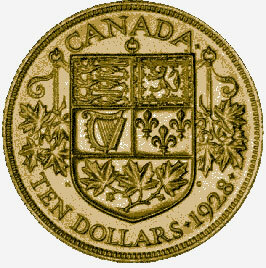 The obverse of the 1928 pattern is identical to that used in the 1912-14 gold coinage. A new issue of gold coins never materialized, however, and only a very small number of these bronze patterns was produced. The piece illustrated here, which is slightly larger than a Canadian 25-cent coin and double the thickness, is part of the National Currency Collection, Bank of Canada.